Ladiesssss...prepare to scream out LOUD ya!?!? Check this out before guessing what sort about here. Kose Warehouse Sale is here!!!! YEAH..!!!! 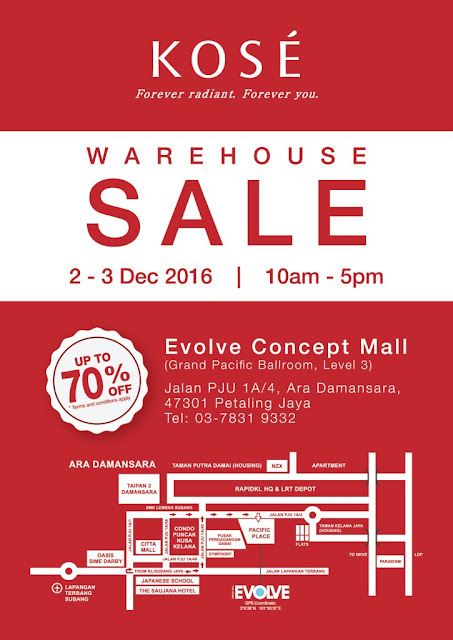 KOSE Malaysia are having their Warehouse Sale at Evolve Concept Mall, Ara Damansara. Enjoy Special Offers,Discount up to 70% Off and many more. Woot-woot!!! Do not panic, mark down your calendar first while getting ready to grab great deals. Happy shopping everyone. **Terms and conditions apply. Limited quantity available, while stock last.